Seattle: Your Rapid Transit System Now Has a Core! Reposted from January 26, in honor today’s big event. 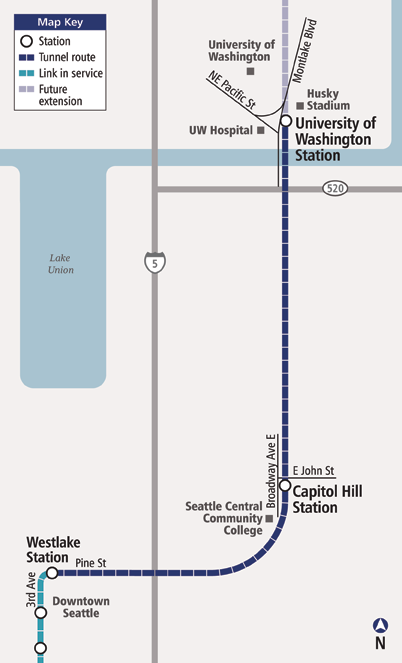 The Seattle region’s rapidly growing rail transit system crosses a major milestone today The segment between downtown and the University of Washington, via a station in t he dense Capitol Hill neighborhood, opens today. And if you vaguely associate Seattle with vast delays and cost overruns on tunneling projects, give Sound Transit credit: This one is 6 months early and $150m under budget. However far the region’s rail transit network expands, this will probably always be its busiest segment. It’s not just that the link between a robust downtown and a major university is the biggest transit market in many comparable cities. 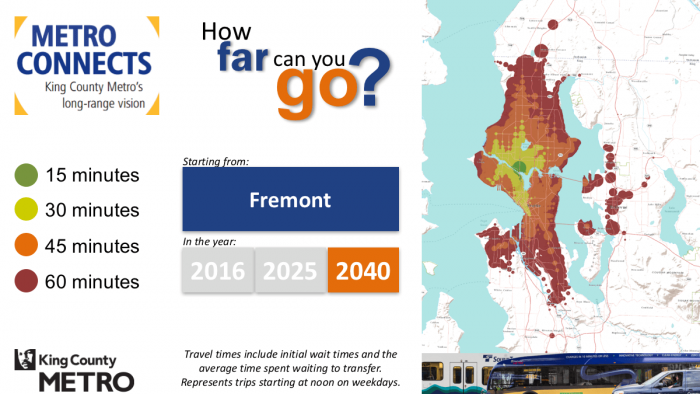 It’s also that a good 40% of the region — northeast Seattle, all the northern suburbs and some eastern ones — will eventually end up on trains through this segment to get downtown. This year will be another milestone for Sound Transit: the 20th anniversary of the passage of its first ballot measure, which funded the now-existing line between the airport and downtown. Through its next successful measure, Sound Transit 2 (ST 2) in 2008, the agency is now funded for long extensions north to Lynnwood and east through Bellevue to Redmond. Meanwhile, they are starting a lively public discussion about the next ballot measure, ST 3, which will probably include an additional rail transit line in Seattle as well as several possible suburban extensions. City of Seattle voters last year also passed Move Seattle, a measure that among other things greatly expands bus service in the city. All in all, a great year for one of America’s most ambitious transit cities. Last Thursday, I joined a panel discussion put on by the Seattle Times about "gridlock". Mike Lindblom of the times summed it up here, and I previewed it here, but I'm thinking about the guy who came up to me afterward. At great length, he told me that Seattle's streets had been planned and designed for cars. He began listing specific streets, why they were built as they were, with the number of car lanes that their designers had intended. He objected to what was happening to his city's streets: replacing 4 tight lanes with 2-3 lanes to add room for bikes, pedestrians, and transit stops. Not because he hates those things, but because we were betraying the original intent of the design. These were meant to be car streets, so they should always be car streets. The conversation sticks with me because he wasn't angry. (Angry people are boring and unmemorable.) Instead, he seemed more offended and hurt. The urbanists remodeling Seattle's streets were betraying a promise that someone had made to him. I don't agree, but I can feel his feeling. This kind of empathy, I contend, is a stance worth practicing. Here's an example, or maybe a confession. I'm one of those tech users who've been trained by experience to fear so-called upgrades. Just now, Apple told me to upgrade to "El Capitan," and all about how it would be better. None of the featured improvements are things I want, so my first reaction is that they're just adding complexity and thus increasing the risk of malfunction and confusion. Based on my experience, I'm entitled to suspect that (a) they've probably introduced new bugs and (b) they've probably wrecked something that I do value about the current version. So I'm kind of person who upgrades at the last possible moment, only when the oldest version is collapsing into engineered rubble. Computers are one of many spheres where I'm happy with what I have and would prefer it quit changing. What's more, what I have and like is what I feel the tech companies promised me, in other marketing messages long ago, a promise that I can now see them as betraying. Maybe you don't have this feeling about computers, but I bet you have it about something. Another word for this feeling of betrayal might be invasion. Because really, we're talking about home, and the fear of the invasion of home. In my early fifties, I'm at home with with my hard disk and thumb drives, just as my mother, in her seventies, is at home with notebooks and manila file folders. When Millennials tell me my stuff should be in the Cloud, it doesn't matter what the argument is. The feeling is that Stalin plans to knock down my sturdy and ancient hovel, move me to a shoebox in a concrete modernist tower, and put all my stuff in some mysterious storage promising me that the System will take care of it. So yes, I'm conservative in this most primal sense of the word: I get defensive about various kinds of home: physical and intellectual. And at this primal level, I bet you are too. You may be sold on the Cloud — and maybe you're right — but I bet you have a ferociously defended sense of home about something. If you feel aversion about something changing, or anger about something having changed, that's it. And this kind of conservatism could be more compatible with advocating necessary change, but only if we who advocate change could hear it, and convey that we hear it. This is the universal fear-image of other people's cars: not your friends and family, and therefore something invading your neighborhood, your home. (It's a night image because in the day you might recognize the driver, and be less fearful.) And so the battle between homes, yours and that evil motorist's, is joined. I think about these things on a rainy weekend to remind myself that conflict about changing the built environment is inevitable, because we are so deeply wired to fear for our homes. What's more, our sense of home can be so extended into the world (as our cars, neighborhoods, or for environmentalists, our planet) that it will inevitably conflict with the "home" of others.. But even if we can't agree with someone about an issue, we should practice empathizing with the feeling that something we rely on is under threat. Because on some issue, I bet you have that feeling too. We were both on the max [light rail]–me heading to the Blazer's game and you on your bike. You overheard part of my conversation with my friend and were quite amused. I wanted to talk to you but then got pushed back by other riders. Email me if you remember that conversation and would like to grab a drink sometime. In rail-rich older urban areas, it's rail transit, of course, the subway or train or metro. But in relatively rail-poor parts of the country, only Oregon and Washington find so much wistful romantic drama on public transit! This is one of those slightly twisted points of "Portlandia"-style pride that makes me proud to be an Oregonian transit planner. One of Bus Rapid Transit's great virtues is that unlike rail, you don't have to build a complete, continuous piece of infrastructure if you really only need segments of one. Unfortunately, Bus Rapid Transit can also be implemented in exactly the opposite way. Severely congested chokepoints are generally expensive places to design transit priority for, especially if you're unwilling to simply take a lane for transit. 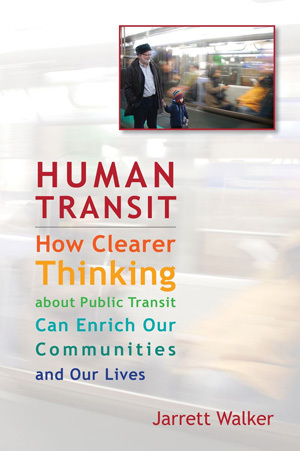 So we often see BRT projects that are missing where they are most needed. The Boston Silver Line 4-5, like the Los Angeles Silver Line, can get stuck in traffic downtown. New York's supposed BRT is so compromised that many refused to call it BRT anymore. Even the world-class Auckland North Shore Busway disappears as it approaches the Harbour Bridge. While the new RapidRide bus mostly lives up to its name in West Seattle, passengers on its sister route to Ballard are routinely stuck in traffic. elayed 10 to 15 minutes by late-afternoon car congestion leaving Belltown and winding through the crowded Uptown neighborhood, near Seattle Center. That bottleneck is aggravated by traffic signals that haven't yet been re-timed by King County Metro Transit and the city of Seattle, to give the buses a longer or quicker green light. Metro acknowledges the D Line is just one minute faster than the local bus it replaced Sept. 29; the advantage is supposed to be six to eight minutes. Transit managers hope to make gains by early 2013 after signal and road-lane changes are finished. "We have a ways to go based on our early experience, but it is still too early to know whether the projection will be achieved," said Metro spokesman Jeff Switzer. Just one minute faster than the bus it replaced? Then the question arises: Why was it called Rapid Ride prior to the improvements that would make it Rapid? There are some plausible if grim answers to this question. Getting multiple big bureaucracies to move on the same timetable to the same deadline is hard. The transit agency has to commit to a date months in advance, without being entirely sure whether its partners (typically in the City and the state Dept of Transportation) will be done with the improvements that are their responsibility. So sometimes, the brand appears before the product does, causing this understandable blowback and also, more critically, tarnishing the brand. Sometimes, too, bridges can be metered, much the way the San Francisco Bay Bridge toll plaza meters traffic on that bridge. At the approach point pictured above, a signal could have been placed at the bus merge point which meters traffic so that northbound congestion piles up south of the bridge rather than on it, and enters the bridge only at an uncongested rate. That would have allowed buses uncongested operation without really slowing down cars much. I'm not an engineer; there may be valid reasons why this wasn't possible, but it's the sort of solution that comes up when congested traffic is the reality anyway and the goal is to protect transit from it. Transit agencies sometimes compromise BRT for their own reasons of budget. Issues of boarding time associated with the lack of on-street ticket machines are coming up on RapidRide, as are concerns about reliability arising from the fact that two RapidRide lines are through-routed, transmitting delay from one to the other. These are familiar struggles within transit agencies who are under pressure to spread a product over many corridors and can't afford to deliver every aspect of the product in all those places. The result runs the risk of becoming symbolic transit; a bright red line appears on the map, but without the investment needed to make good on the promise that the red line implies. I've received emails from Seattle friends on several sides of this issue, and sympathize with all of them. I don't mean to criticize either the City or the State DOT or the transit agency, because what was done here is fairly typical historic American practice and the pressures involved are so routine. But if there is a desire to aim higher than historic American practice, the question remains. How much can we compromise BRT — tolerating its absence precisely in the congested chokepoint where it's most needed — and still call it BRT? Might be better for transit agencies to refuse to implement BRT until the relevant traffic authorities have delivered the facilities it requires? Bravo to Seattle's King County Metro for their new system maps, which finally reveal their Frequent Network. All can be viewed and downloaded here. The wide blue line is light rail and the red lines are the new Rapid Bus product (both frequent and relatively fast). The rest of the bus network is clearly presented in ways that advertise its frequency and span, so that (a) the Frequent Network jumps out at you and (b) services that run only at rush hour recede from attention so that you can clearly see the network that runs all day. They do this by using black (numbers and lines ) for the Frequent Network, then solid blue for the other all-day service, then paler blue with blue-outlined white number bullets for the peak-only services. Works for me. What do you think? If your transit agency hasn't figured out Frequent Network mapping yet, show them this map, and tell them to read Chapter 7 of my book, or this! RapidRIde is King County Metro's new rapid bus product, with widely spaced stops, high frequency, special stations, but usually no exclusive lane. Note how cleanly this legend distinguishes services that are useful for different purposes. Note too that it omits peak-only commuter express services, because if they were present they would be lots of confusing overlapping lines that would make the basic network impossible to see. So here's a piece the map. Click to enlarge, but more important, go here (that's an order) to see the whole thing. The distinctions on this map are entirely about what matters to the customer, especially the person who wants to see the all-day transit network that is ready to liberate your life, not just your commute. Red means fast and frequent. Blue means frequent. Green means all day but not frequent. And if you want to see peak commuter express services, which would obliterate the legibility of this map if they were included, see another map or individual timetable. To be fair, many good maps do show peak only services and visually de-emphasise them as faint dashed lines. That works too, but the key design principle is this: The network of any particular layer in the hierarchy of service should be clear without being obscured by lower levels of service. This map does that perfectly: You can see just the red Rapid Ride line, or you can focus easily on red plus blue to see the frequent network, or you can notice the paler green and see the all-day network. All in one map. To get to this kind of customer-centered clarity, note what they had to omit: Two transit agencies' services are presented here with no differentiation at all. Bus routes numbered in the 500s belong to Sound Transit while the others belong to King County Metro. Most multi-agency regions would focus on highlighting this distinction first, on the assumption that the customer's loyalty to a transit company is much more important than their desire to get where they're going. The distinction should arguably be at least a footnote if you don't have integrated fares between the companies, as it could imply fare penalties and different fare media. Some multi-agency maps do show all operators, but still visually distinguish them, as the Los Angeles Metro map does, for example. But if you want a really simple map, reduce the transit company's identity to a footnote, or something that can be inferred from a route number*, or don't even show it at all. Instead, show the customer what matters to them: frequency, speed, and duration of service. *Can you spot the one place on the LAMetro map where they do that? The answer is in "Joseph E"'s comment below.